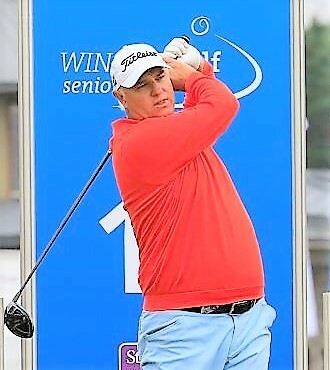 Stephen Dodd expanded his lead at the WINSTONgolf Senior Open and will take a seven-shot advantage into tomorrow’s final round at the German venue. The Welshman did not drop a shot on the WINSTONlinks course, carding six birdies in the process to sign for a 66, which was the best round of the day. Despite the clean scorecard, and the steady march under par, the 51-year-old did not feel his game was quite as solid on Day Two. “I didn’t play as well today,” said Dodd. “I was just, I suppose, efficient is one way of putting it. I didn’t waste anything, but I didn’t hit it particularly well, I was just scoring. With three European Tour titles to his name, the Cardiff native will be seeking his third-consecutive winning-season on the Staysure Tour after triumphing in 2016 at the Senior Italian Open and again last year at the Farmfoods European Senior Masters. Even with experience on his side, the man who will celebrate his 52nd birthday tomorrow refuses to take anything for granted. “I’ve won fairly recently on the Staysure Tour, so I know what actions to go through, so we’ll just hope they stand me in good stead,” he said. “I’ll still have to grind it out and get a little bit of luck on my side as well — that always helps. Chasing him down is a very capable pack of golfers, led by two men — Argentina’s Cesar Monasterio, and the most recent winner on the Staysure Tour, Frenchman Jean-François Remesy — both of whom fired five-under-par 67s today to share second place on seven under par. Remesy, who has won several big tournaments in his career, including back-to-back titles at his native Open de France in 2004 and 2005, has clearly carried his recipe for success into this week. “Stephen looks like he’s in really good form,” said the Swiss Seniors Open champion. “But I will just continue to play my game. I’m enjoying being in contention, it’s what we all work for. Monasterio, a winner on the European Challenge Tour, the European Tour and the Staysure Tour, does not intend to change his game plan, and knows that he will need to be sharply focused all the way around the challenging ‘inland links’ design. “For me, I think the key is to take it shot by shot and stay focused on the shot I am playing,” the 2014 English Senior Open champion said. “When I get on the greens, it requires double-concentration because they are very tricky. The final round of the WINSTONgolf Senior Open will begin tomorrow at 8:45 am local time with the leaders, Dodd, Remesy and Monasterio, teeing off at 10:30 am.